← 90% Of Japan’s Rural Stations Show Cooling Or No Trend Over Past 2 Decades! SEA ice volume is fourth highest since 2003, and melting very slowly. Arctic sea-ice is about the same as 1971. AUSTRALIA’S professional warming alarmist, Tim Flannery, believes we will “see an ice-free North Pole in 2018”. ARCTIC temps have been below the 1958-2002 average nearly everyday during the summer melt period. OVER the past 20 months, more than one trillion tons of new ice has formed on Greenland’s surface. 2017-18 ice accumulation is well above the 1981-2010 average. GREENLAND’S surface is rapidly gaining ice, and the largest glaciers are growing and also expanding. OF COURSE, the fake news media reports the exact opposite of the truth. IN August 1934, when CO2 was at ‘safe’ levels, severe to extreme drought covered around 80% of the entire US. Such conditions endured for most of the decade known as the “Dust Bowl” era. CURRENT U.S. drought conditions under Donald Trump’s reign of climate “denial” terror. ACCORDING to the EPA, the low-CO2 1930s had (by far) the worst heatwaves in US history. AUSTRALIAN tropical cyclones are declining in both, intensity and frequency as CO2 increases. NO trend in Global Tropical Cyclone Frequency as CO2 increases. GLOBAL Major Hurricanes are declining in frequency as CO2 increases. 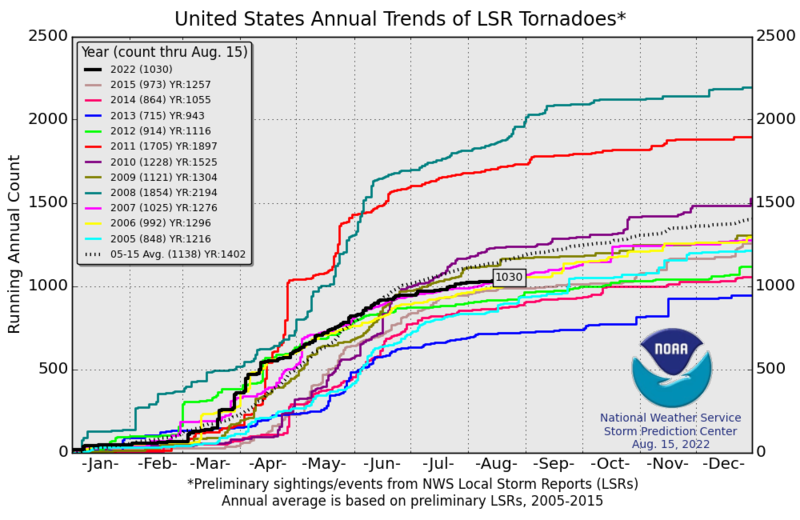 2018 is shaping up as one of the least active US tornado years on record, despite record and rising CO2 emissions. GLOBAL weather disasters as a percentage of global GDP are declining as carbon dioxide emissions are increasing. THE IPCC’s latest report on “Extreme Weather” – no change from AR5. “Low Confidence” that extreme weather events are caused by greenhouse gas emissions! Props to the @IPCC_CH for accurately reporting the science of extreme events. AS with most climate scare-mongering that is primarily driven by emotion, ideology, politics and/or climate models, the rhetoric and fear-mongering never seems to stack up against observed reality, data or actual facts. Global food production another classic case in point. The second report projects decreases in corn (maize) production due to increasing heat waves. This increase in extreme heat was based on the same exaggerated 4oC increase in temperature as the first study. According to the USDA, corn is the largest component of the global grain trade, and the United States is the world’s largest producer. Corn is thus one of the country’s most important agricultural products, processed as sweet corn, cornmeal, tortillas and, thankfully, bourbon. It also is the primary feedstock to fatten cattle, chickens and hogs. Fortunately, despite a continuing rise in temperatures, the world and America have set new corn records on an annual basis. The world’s remarkable ability to increase food production year after year is attributable to mechanization, agricultural innovation, CO2 fertilization and warmer weather. World grain production figures show that crop and food production has steadily increased, with only positive effects from our changing climate. GLOBALLY, seas have risen 400 feet, 120 metres or 120,000mm over the past ~15,000 years, since the end of the last Ice Age. Over the past 200 years seas have been rising at a relatively steady rate. SEAS have not stopped rising since the end of the last great Ice Age ~20,000 years ago. However, what is pertinent to the sea-level rise debate is whether SLR is accelerating due to human CO2 emissions. ACCORDING to “the science” there has been no stat-sig or relevant acceleration of sea-level rise since industrialisation. Sea-levels both rise and fall depending on where you are on the planet. Absolute sea-level varies from negative to positive to stable depending on a range of regional factors including: local vertical land motion, land use, salinity, regional ocean circulations, ocean heat content and tidal variations. Something other than CO2 caused seas to rise at the current steady rate around 1790. No statistically-siginificant acceleration since ~1790. MORE forests globally and “deserts greening” will, no doubt, come as unwelcome news to the environmental movement who rely on doom and gloom to drive their misanthropic, anti-capitalist climate change agenda. GLOBAL temperatures simply have not been rising in accordance with UN IPCC climate model predictions that underpin the global warming scare. UPDATE : “The Pause” Celebrates Its 20th Birthday! FOR so long, climate ‘sceptics’ have been labeled climate/science “deniers” in crude reference to those who deny the holocaust, with the pejorative used in a broader effort to shut down debate and silence dissent. However, when hard evidence is laid out over alarmist rhetoric, it’s not hard to see who in fact are the real deniers of history and indeed, deniers of science. EVEN when hard data, “the science” and empirical evidence completely contradicts alarmist predictions and forecasts peddled by the mainstream media and grant-driven ‘scientists’, alarmists continue to double down on their fear-mongering instead of evaluating their theory and admitting that they might just have got it all wrong. GLOBAL WARMING dogma has ruinously snowballed into a TRILLION dollar religion to be defended at all costs by alarmist ‘scientists’ and the fake news media in order to protect egos, jobs, reputations and access to unlimited “Save The Planet” taxpayer trillions, immune to oversight.